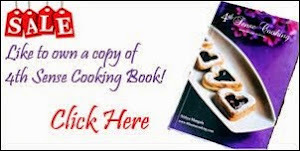 Coarsely chop the chocolate and set aside. Heat the cream and butter in a saucepan, stirring to blend. When bubbles start to form along the edges of the pan, remove from heat. Pour it over the chopped chocolate and stir gently until the chocolate melts and blends well with the cream and butter. Collect the chocolate into a shallow bowl. Cool on a rack for 15 minutes, then cover the bowl with plastic wrap and refrigerate until firm. This would take a minimum of two hours. Using a tablespoon or a melon baller scoop out enough chocolate to make balls of desired size. Roll the balls in cocoa powder and place the balls on a butter paper. Refrigerate until serving. Its best when served at room temperature for a soft and melt in the mouth truffle. The above said measurements would be sufficient to make 10 truffles. The chocolate will be sticky. So dust your hands with cocoa powder and roll the balls quickly. 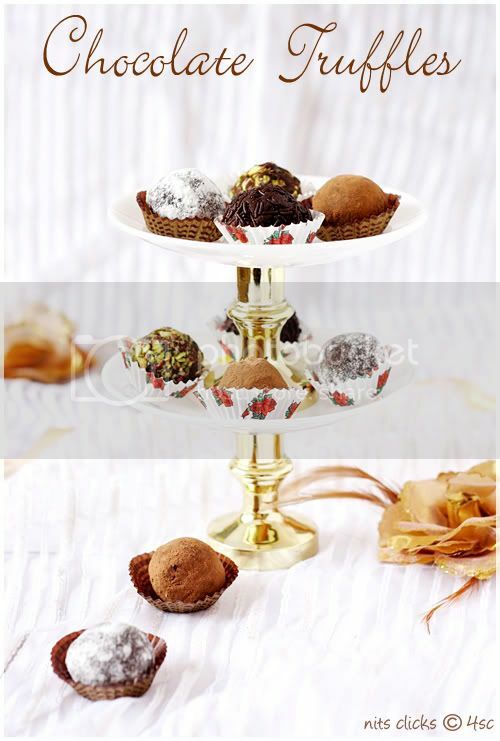 If the consistency of the chocolate truffle is a little runny, add finely crushed biscuit powder to the chocolate and mix well before making balls. You can use 100gms of Semi sweet chocolate and 100 gms of bitter sweet chocolate as well. Add few drops of vanilla essence for extra flavoring. You can also add a tsp of instant coffee powder and 1 tbsp of coffee liqueur for a difference. Adding few drops of orange emulsion or essence can give you a delicious orange chocolate truffle. 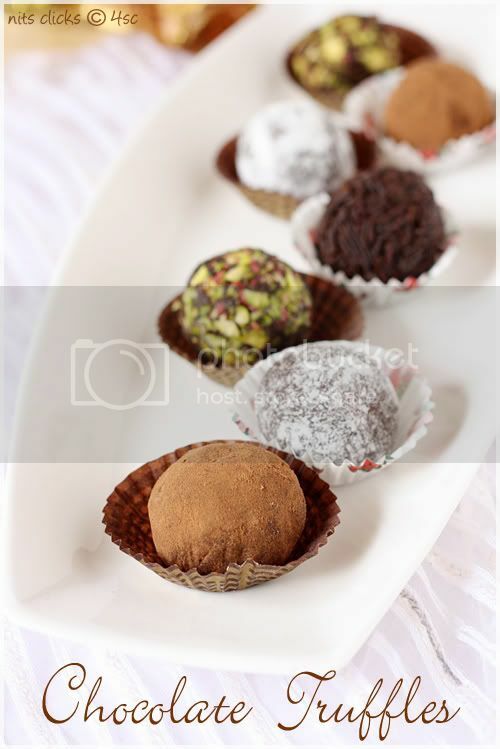 You can roll the truffle balls in icing sugar, finely chopped pistachios and chocolate vermicelli too. Oh My You have let loose a big craving in me now. Have to go to the nearby shop for a big bar of choc to appease for now. My kids would go nuts when I show them these later. I love the nutty one the best. Love that creative cake stand. I have to make these truffles one day. I too am in ur company of choco love...and wow u made so many versions. Each one equally tempting! Gorgeous parade of truffles each one so very tempting. Though I am a BIG Chocoholic myself,never tried making truffles.Seeing your pics,I guess I shouldn't delay any further! !Looks perfect!! I am also a TOTAL chocoholic! Those truffles look YUM! They look so nice and delicious. Lovely presentation. OMG!! This sure looks divine very rich...gr8 efforts...I must make these truffles one day..
Ghosh Nithya...Just too heavenly & divine!!!! Irresistible, chocolaty truffles!!!! Mind blowing,awesome,superb and wat else to tel.No words to explain ur clicks.Loved the first and last click.Though im not very fond of chocolates ur truffles is tempting me a lot. wow, they are super delicious. Lovely presentation. that way all our diet plans will go to vain. what a recipe and clicks. 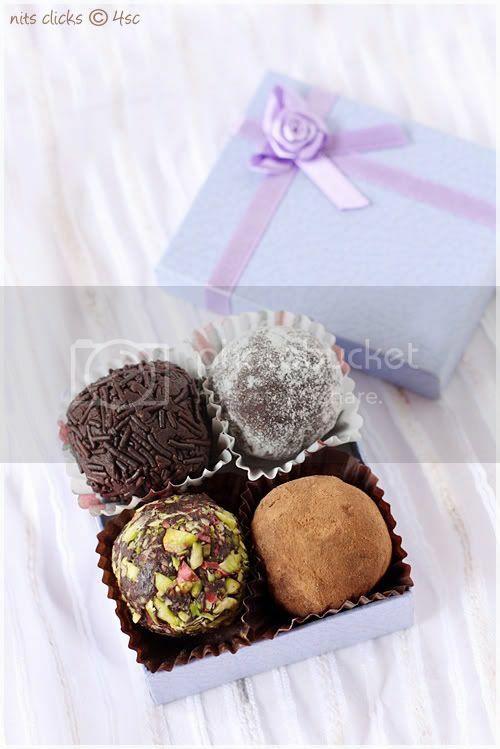 Chocolate truffles look amazingly delicious and vivid. Can't stop drooling over them. Innovative idea of using the table lamp stand as cake holder..Looks amazing , extraordinary efforts well paid off in the end..
wowww looks gorgeous as usual nice presentation!! I admire you. 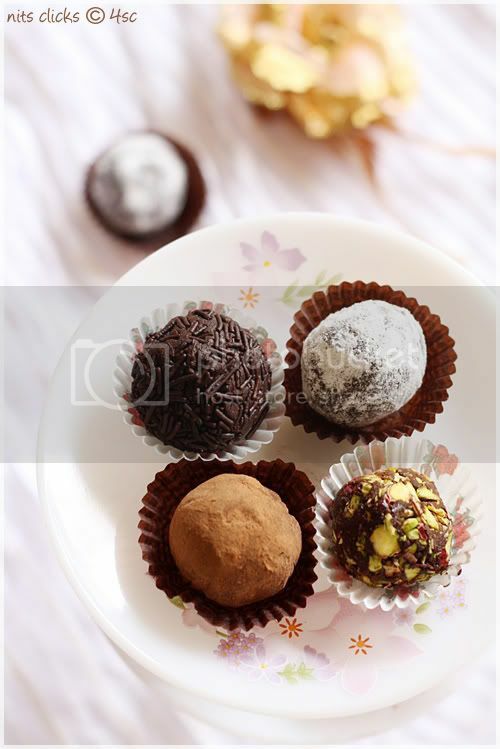 choco truffle balls are superb looking. 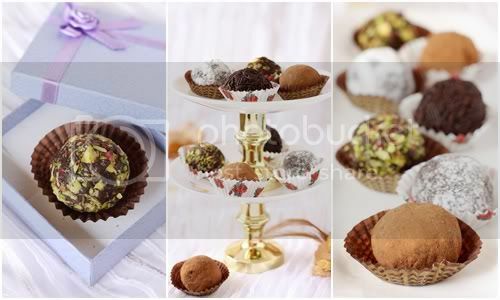 Lovely truffles and absolutely gorgeous pictures!!! Truffles look amazing.. Awesome clicks..
Nithi there is no match to your culinary prowess and creativity. No matter how much I try and learn to take a good click, the Nithi factor will always be missing!! I seriously think you must do something more with this talent. The rate at which your photos are evolving..the Nithi factor might soon become a verb on the dictionary! !God bless.Enjoyed your tutorial too. Ahhh I'm drooling over !!!! the pistacho one is dfntly my fav ....Love the clicks too !!! 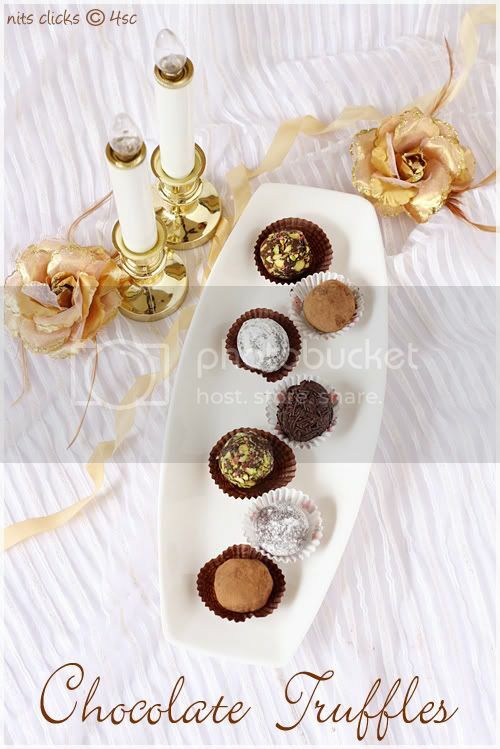 Wow....... truffles looks gorgeousand tempting.... beautiful presentation. 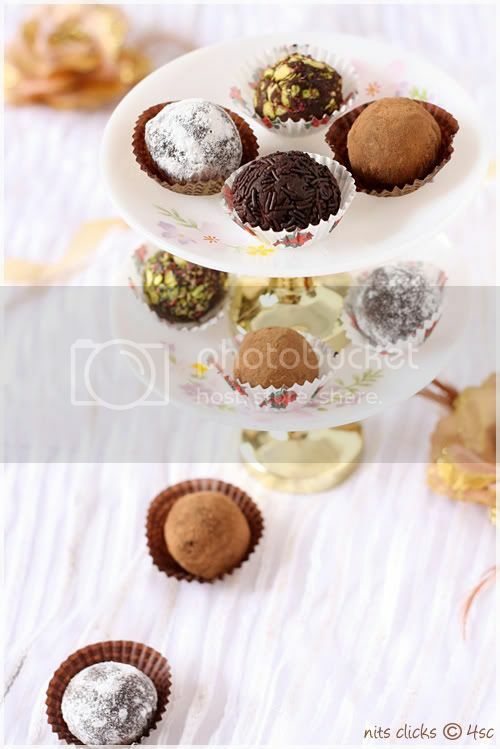 Absolutely tempting truffles... pictures are beautiful as always.. wish i can have some. Delicious looking chocolate trufles. Lovely preparation. I really liked the recipe, beautiful photos, you have good recipes that I admire very much, hugs and good week. Wow wow wow.......these truffles are mouthwatering. Wow!! Its delicious. I like to gift a "flavorful collection of heart shaped belgian chocolates and cashew nuts" to my girl friend. She is a chocolate lover. I am buying this from http://www.chocholik.com/shop/person/ . Could you please tell me is it good for the Christmas gift, and also recommend me other online store for gift products.